Arguably, out of all the surfaces in a home, kitchen countertops get the most use and perhaps the most abuse. It is the place you food prep, the spot you park your coffee marker and (hot) toaster. It is even home to random items like those house keys you toss there daily. Sure, stone countertops can stand up to all of the above on a daily basis, but there is another material worth considering—recycled glass countertops. They are durable, easy to clean, and of course attractive. To whet your appetite for this beautiful surface, we gathered our favorite examples for busy cooking spaces. When it comes to everlasting beauty, we love recycled glass surfaces like these Alpine White countertops by Brooklyn based, IceStone, shown in this kitchen by Howells Architecture & Design out of Portland, Oregon. The sturdy material is a mix of 100 percent recycled glass combined with Portland cement and non-toxic pigments. The result is a surface that is both heat and scratch resistant. We also love that it is an eco-friendly material that reduces the amount of glass waste that winds up landfills. Vetrazzo is another recycled glass countertop manufacturer that combines cement with glass. Their work uses larger chunks of glass to create a bejeweled like surface that takes eight people to handcraft. 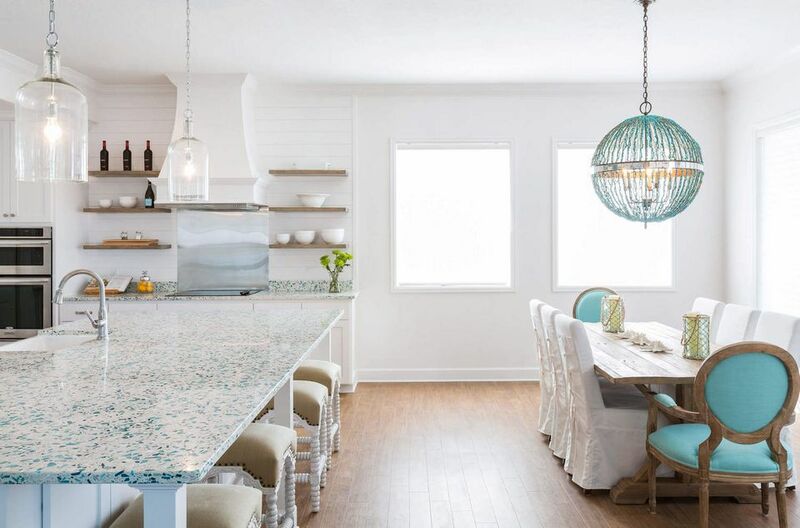 Here Vetrazzo countertops in a color combo called Floating Blue with Sea Pearl sprinkle on pops of color in this white cottage kitchen by Laura U Interior Design, a design firm out of Houston, Texas. Bamboo doors, purple cabinets, and custom tile made this eco-friendly kitchen remodel by California based Green Goods a real stand out. But our favorite feature is the multihued, recycled glass countertop by Vetrazzo that transforms discarded bottles and jars in a durable work surface. Here is another example of how recycled glass countertops can lend vibrant color and visual texture to a white cooking space. The decorating team at Cortney Bishop Design paired Denim Moss countertops with a beach blue retro range by Big Chill. Depending on the color, recycled glass countertops can resemble sparkly granite. Case in point, this Sky Pearl countertop in a kitchen remodeled by Crawford Builders situated in Houston, Texas. We truly believe when it comes to enduring style and the best bang for your remodeling dollars, you will never regret installing a white kitchen, and this gorgeous one by Massachusetts based CW Designs perfectly illustrates our point. Alpine White recycled glass countertops are combined with flat front cabinetry for a fresh, contemporary look that feels timeless. Warm wood cabinets blend beautifully with the Alehouse Amber recycled glass countertops by Vetrazzo in this kitchen by Riddle Construction and Design out of Redmond, Washington. As its name implies the material is speckled with glass from brown and green beer bottles. Perk up a neutral kitchen with millefiori inspired countertops. Here Sacramento, California based Uhrich Design did just that with a recycled glass surface by Vetrazzo called, Mille Fiori. The vibrant material incorporates 12 eye-popping shades of recycled stained glass, which when combined creates a delightful confetti effect. The multihued backsplash adds to the kitchen's colorful vibe. A warm and woodsy kitchen by San Jose, California based Rehder Construction gets a recycled glass countertop in a pattern called Charisma Blue with Patina. The glass used is mostly from beer, wine, soda, and sparkling water bottles. The custom tile backsplash on the back walls picks up many of the colors spotted in the countertop. The owner of this home did not want the kitchen to feel dark or gloomy, so the vaulted ceiling was painted white. What we love best about recycled glass surfaces is that they are available in a broad range of gorgeous colors. In this bold kitchen by Dansky Cabinetry out of Oregon, a recycled glass countertop featuring chunks of red glass pair beautifully with the glossy custom cabinets. There is no doubt when it comes to kitchens, contemporary modern farmhouse style is sticking around. This crisp example by Reico Kitchen and Baths in Virginia features shaker style cabinets in painted Super White by Benjamin Moore and a kitchen island in Web Gray by Sherwin Williams. The countertops throughout the cooking space are recycled glass in Palladian Gray by Vetrazzo. Green and brown are the dominant colors in this remodeled kitchen in a redwood retreat by Santa Cruz Design and Build situated in California. The Bistro Green recycled glass countertops are by Vetrazzo. The ceramic backsplash is made up of custom tiles. The stainless steel appliances are a mix of brands: Subzero, Wolf, and Miele. A teak coffee station on the far left helps to keep the countertops clutter free. The floor is elegant and practical cork. This condo kitchen by Crown and Trim By Design out of Florida features bio-glass countertops. Bio-glass countertops are another eco-friendly kitchen material worth exploring. Each upcycled glass slab typically consists of up to 100 percent recycled glass from beer, wine, and sparkling water bottles sourced from recycling centers. Bio-glass countertops are usually available in cools shades of blue or green and more often than not, do not include colorants or additives. While bio-glass stands up to heat and resists stains, it dings and chips more easily than countertops made of glass and cement. Instantly give a white kitchen a coastal vibe with Bretagne Blue recycled glass kitchen countertops. Here a lovely beach cottage by Cortney Bishop Design combines blue speckled counters with fresh white cabinetry, natural wood accents, and farmhouse inspired furnishings. The result is a calm and relaxing space that is also incredibly chic.